Arsenal are being frustrated by ten-man Atletico Madrid at the break. Arsenal started the game well and Oblak had to be at his best to ensure the Gunners didn't take an early lead but as the half progressed Atletico got more comfortable and had a chance of their own. There is still plenty of work for Atletico to do, but Arsenal will have to play much better if they are to take a lead to Madrid. Arsenal XI: Ospina; Bellerin, Mustafi, Koscielny, Monreal; Ramsey, Xhaka, Wilshere; Özil, Lacazette, Welbeck. Atletico Madrid XI: Oblak; Vrsaljko, Gimenez, Godin, Lucas; Correa, Thomas, Saul, Koke; Griezmann, Gameiro. That's it from us tonight. Atletico Madrid and Marseille will be happy with the first leg results but Arsenal and Salzburg are still in the mix. We will be back next week bringing you all the updates from the second legs. Thank you for following Firstpost. Good night! Atletico have been able to get out of their own half a bit in the last five minutes but with very little threat to Ospina's goal. Arsenal are flying now and sense blood. They have Atletico pinned deep into their own half and the Gunners are piling on the pressure in search of a second goal that would really put a lot of pressure on the visitors. Crucial time in the tie. Can Atletico keep Arsenal down to just one goal? Arsenal with a good spell of possession but just like much of the first half, Atletico defending their box extremely well and not allowing Arsenal a clear sight of goal. But the Gunners have certainly upped the ante after a slow start to the second half. The question is can they sustain this pressure and force an error from Atletico? A rare spell for Atletico in the Arsenal half. Antoine Griezmann lets one fly but Ospina collects low to his left. Simeone's men have managed to take the sting out of the Arsenal attack to an extent and will be happy with the proceedings so far especially after the red card. Not the best record to have! Laurent Koscielny misses the target from close range after receiving a flick-on from Lacazette. The next five minutes after the chance has been slightly better for the visitors who have stemmed the flow of Arsenal attacks and slowed the game down slightly. 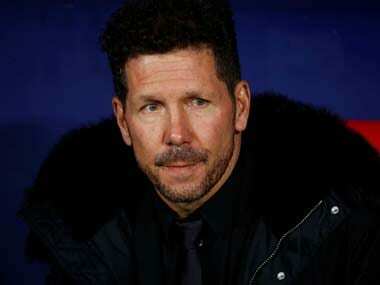 The visitors are losing their cool a bit and coach Diego Simeone has been sent to the stands for constant protests. The red card has just disturbed the rhythm of the contest as Arsenal are yet to truly hurt the visitors since being reduced to ten men. Less than 10 minutes to go for kick off! __________ & __________ will contest the #UELfinal. 🔝⚽️ 😀#ArsenalAtleti is nearly here! Alexandre Lacazette arriving at the Emirates stadium. 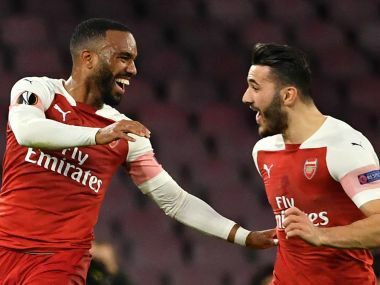 Having scored twice at the weekend, the Frenchman will be key for Arsenal's chances against what is expected to be a stubborn Atletico Madrid defence. Can Lacazette deliver at the big stage and justify the price that Arsenal paid for him in the summer? Welcome to the Live coverage of Europa League semi-final 1st leg between Arsenal and Atletico Madrid at the Emirates stadium in London. 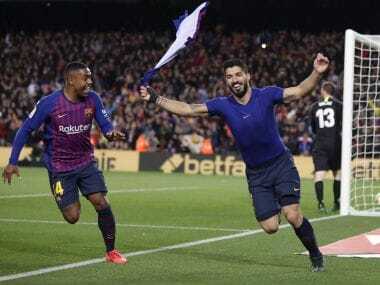 Arsenal will be looking to send off Arsene Wenger with a trophy and thereby qualify for next season's Champions League, while Atletico Madrid will look to add a trophy to their cabinet. 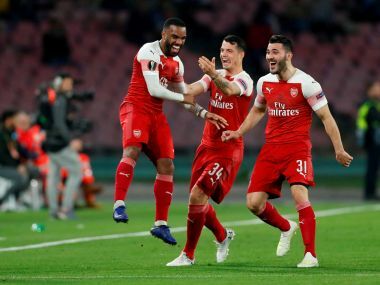 Preview: Arsenal players Mesut Ozil, Petr Cech, Sead Kolasinac and Jack Wilshere on Wednesday returned to practice on the eve of the first leg match of the Europa League semifinals against Atletico Madrid. The four players missed Sunday's English Premier League (EPL) match against West Ham United due to injury or illness, reports Efe. Ozil missed the match against the 'Hammers' due to illness, while Cech had a small ailment in the hip and Wilshere and Kolasinac suffered from ankle injuries. Absent from Wednesday's session were Henrikh Mkhitaryan, who exercised alone, and midfielder Mohamed Elneny, recovering from injury. Neither Mkhitaryan nor Elneny will be available for Thursday's game against Atletico at home, although Mkhitaryan could return in time for an away match against Manchester United on Sunday. Arsenal is to host Atletico Madrid on Thursday night in the first leg of the Europa League semi-finals, which will be the last European match at home for veteran coach Arsene Wenger, who will leave the Gunners bench in June after 22 years of leading the club. 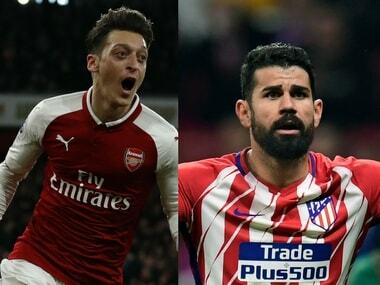 Atletico Madrid coach Diego Simeone has announced that Diego Costa, who missed the last three games with a muscle injury, was among the 20 players called up for the first leg of the Europa League semi-finals against Arsenal. Costa, who did not train with his teammates on Tuesday, had suffered a left leg injury in the quarter-final match against Sporting Lisbon on 12 April and was sidelined during the La Liga matches against Levante, Real Sociedad and Real Betis, reports Efe. However, the Spain forward has been included in the list, along with the rest of the available first squad members and three players from Atletico B: goalkeeper Alex Dos Santos, defender Sergio Gonzalez and midfielder Roberto Olabe. Both Juanfran Torres, who sustained a hamstring injury during Sunday's game against Real Betis, and Filipe Luis, who is still recovering from his injury, were not included in the list. Atletico is set to be hosted by Arsenal at the Emirates Stadium on Thursday.